04/03/2019: County Bridge L-12 on Hill Road in Lebanon Township is closed to all traffic starting immediately – until further notice. There was a partial collapse of the stone arch bridge. 8/30/2018 T-73 UPDATE: Please be advised this bridge is now closed until further notice. After inspection in the field there was more damage than originally thought so the bridge will have to be rehabilitated. Until the rehabilitation can be completed, the bridge will remain closed for safety reasons. Bridge closure estimated through Summer of 2019. County Bridge T-73 located on Meadow Lane in the Township of Tewksbury. Bridge T-73 is located at the intersection of Rockaway Road and 8/10 of a mile from Bissel Road. Bridge T-73 will be CLOSED for approximately 4-5 weeks for Emergency Priority Repairs. The county will be placing signs for a detour: Bissel Road to Rockaway. UPDATE: 03/19/2019 - Culvert C-67 will be CLOSED Wednesday March 20, 2019 and will remain closed until May, 2019. C-67 is located on County Route 639 (High Bridge-Cokesbury Road)Clinton Township). The Contractor for this project is CMS. The Culvert is being replaced and intersection improvements will be done. A detour has been posted. - Click here to see the Traffic Detour Plan for this project. UPDATE: 03/13/2019 - this project will begin on or about March 15, 2019 through the end of May, 2019. COUNTY CULVERT C-67: Be advised that CMS Construction is scheduled to start the culvert reconstruction project on Monday, July 23, 2018 in the Township of Clinton. This work will require the closure of County Route 639, High Bridge-Cokesbury Road at the crossing. 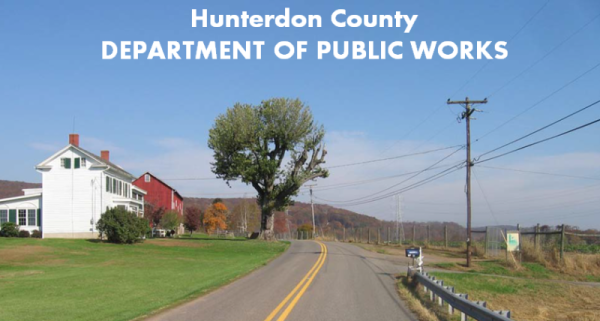 Hunterdon County Culvert L-77 located on Hollow Road in Lebanon Township will be CLOSED on or about July 1, 2019 until the end of August. CONTRACTOR: State Line Construction Co. Please be advised that County Route 519, Warren Glen Hill will be closed on March 4, 2019 for construction. Closure will be for 1 construction season and should open around November 2019. 2019 – The major construction of the project will occur in 2019. The roadway will be closed, traffic control will be a Detour. It is expected to start in March and run for one construction season. After the 2019 construction season the roadway will be reopened but the project will not be completed. 2020 – The project will be completed during the 2020 construction season, expected to start March 2020, traffic control will be single lane with alternating traffic during the day. UPDATE: 04/01/2019 - Construction has begun. DURATION: Start on or about April 1, 2019 and continue until June, 2019.